10 As Pharaoh approached, the Israelites looked up, and there were the Egyptians, marching after them. They were terrified and cried out to the Lord. The Egyptians had quickly lost the anxiety of the plagues and the loss of their first-born. They had cried out to the Lord (v.10) but quickly switched to Moses, a more accessible target for their all-too-human (and humanly wrong) reaction. There is some biting sarcasm here, because Egypt at that time was obsessed with graves and had large areas of burial grounds. “Say to you” – to say and to ‘think in the heart’ can be the same in Hebrew. This is the accusation made earlier in Exodus 5:21. “Deliverance” – literally ‘salvation’ but this is more in the sense of them being delivered from the threat. There is little distinction in Hebrew between salvation, deliverance and healing. Moses gives three patient instructions in the turmoil: (1) do not be afraid, (2) stand and expect the Lord’s deliverance, and (3) be still i.e. stop all action. Reminding Moses of the enduring promise to take them out of Egypt and give them the land of Canaan – the petition is already granted. His responsibility in faith is to keep everyone moving into the promise, expecting a way through. 16 Raise your staff and stretch out your hand over the sea to divide the water so that the Israelites can go through the sea on dry ground. 17 I will harden the hearts of the Egyptians so that they will go in after them. And I will gain glory through Pharaoh and all his army, through his chariots and his horsemen. 20 coming between the armies of Egypt and Israel. The angel of God and the evidence of the presence of God, the pillar of cloud moved from ahead of the refugees to behind them and produced darkness with the opposite effect on the pursuing army, to the light and reassuring presence for the Israelites. Throughout the night the cloud brought darkness to the one side, and light to the other side; so neither went near the other all night long. The strong wind is a natural element, but the effect of the wind to bank up the water as a heap and create dry ground for the crossing, can only be explained by a miraculous event. 23 The Egyptians pursued them, and all Pharaoh’s horses and chariots and horsemen followed them into the sea. The exact location is debated, but recent scholarship and archaeological discovery has pointed to the tip of the Gulf of Suez, where divers have photographed unusual coral-encrusted shapes of wheel and spokes, providing evidence for the ”jammed wheels’ of v.25. 24 During the last watch of the night, the Lord looked down from the pillar of fire and cloud at the Egyptian army and threw it into confusion. The ‘look’ of Yahweh appears to have been more of a blinding flash which caused the charioteers to run into each other. The wording of Psalm 77:16–20 suggests a thunderstorm, or a frightening occurrence resembling a thunderstorm. The last watch of the night, 2am-6am, is the traditional time to mount an attack when visibility and morale are at their lowest. Chariots with open unprotected wheels would be prone to lock if they touched. Rather than wheel around the Israelites, they were confined to the same narrow channel between the walls of water. 27 Moses stretched out his hand over the sea, and at daybreak the sea went back to its place. 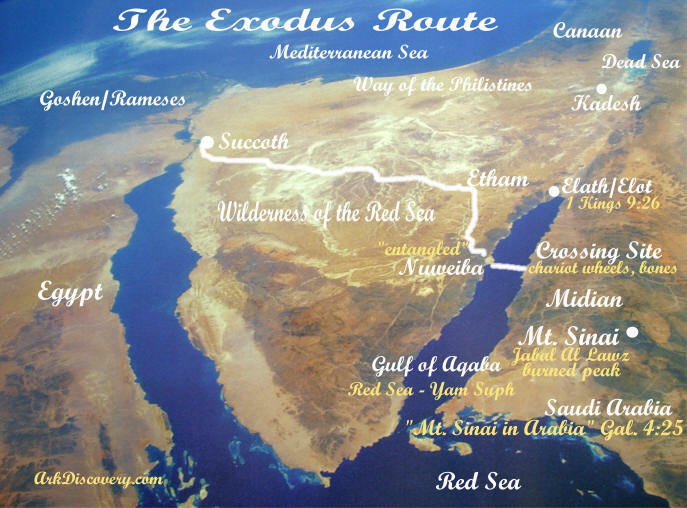 The Egyptians were fleeing toward it, and the Lord swept them into the sea. The action by Moses was necessary to show that the return of the water was an act of God, not just a freak of extraordinary weather. 28 The water flowed back and covered the chariots and horsemen—the entire army of Pharaoh that had followed the Israelites into the sea. Not one of them survived. “Not one of them survived” is qualified by “that had followed the Israelites into the sea” – those that went into the gap, perished in the gap when Moses called down the return of the water. 20 But the Israelites went through the sea on dry ground, with a wall of water on their right and on their left. 30 That day the Lord saved Israel from the hands of the Egyptians, and Israel saw the Egyptians lying dead on the shore. There is a Twentieth Century Fox finality about this scene which made this miracle at the Red Sea the enduring symbol of Israel’s salvation, recounted in verse and song by one generation to another. Miriam (the same name as Mary in the NT) was probably a praise leader of the women and is described as a prophetess, an unusual word also applied to Deborah, Judges 4:4. She claimed to bring God’s word just as Moses had, Numbers 12:2. Although she is Moses’ sister, she is described as Aaron’s sister, perhaps making a point about lesser rank. This was a huge and miraculous deliverance in every aspect. God is loving and God is strong – and God is faithful when His people turn to Him in repentance and prayer. There is also a note of desperation here, but Moses is hearing God in it all. What is God saying in a situation? We need to persist and hear. “Faith comes by hearing”, and then we know how to pray – and act. What helps us to hear God in the emotional clamour of a crisis situation? See verses 11-15 for what not to do, and what God looks for.